One day Hunca Munca and Tom Thumb, two young mice who live in a children’s nursery, decide to explore the beautiful doll’s house made of red brick. The mice sneak up the stairs into the dolls’ dining room. What should they find but a sumptuous feast of lobster, ham, fish, pudding, pears and oranges! But to their dismay, they discover the food is made of plaster and paint-–not good to eat at all. In a huff, the disappointed mice turn the house upside down! 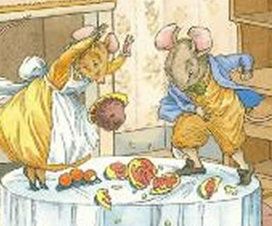 Beatrix Potter’s merry tale about two rascally mice has been delighting children for generations.